The presence of Sacajawea and her baby helped the Corps of Discovery prove during potentially hostile encounters with Native Americans that they were not a war party. The Louisiana Purchase of 1803 intensified American migration to the west that was already well underway. Anglo-American settlement in the 18th century had largely been confined to the eastern seaboard. It made its boldest inroads where rivers allowed easy internal transportation. As a result the chief population centers of early North America were clustered on the coast or along its major inland waterways. In 1790 the fast-growing population of the United States was 3.9 million, but only 5% of Americans lived west of the Appalachian Mountains that run from Maine to Georgia. By 1820, however, the total U.S. population had already reached 9.6 million and fully 25 percent of them lived west of the Appalachians in nine new states and three territories. Cincinnati, in present-day southwest Ohio, provides a good example of the speed of western expansion during the early republic. Founded in 1788 as a fort to repel Shawnee and Miami Indian attacks, it served a chiefly military purpose until the major Indian defeat at Fallen Timbers in 1794. Soon thereafter, however, its location 450 miles downriver from Pittsburgh, Pennsylvania, made it a strategic trade location for agricultural products from newly settled farm lands. Although its population was a modest 750 in 1800, by 1810 that figure had tripled and vastly larger numbers passed through Cincinnati on their way to settle the "Old Northwest" of Ohio, Indiana, and Illinois. 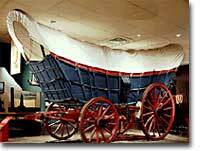 Conestoga wagons, most commonly found during a 100-year-span starting in 1750, carried everything from flour to furs, and became the symbol of settlers' journeys to the western frontier. Western migration had become central to the American way of life and as much as two-thirds of all western families moved every decade. Interestingly, Cincinnati's most important trade connection was not with relatively nearby (but upriver) Pittsburgh, but instead lay 1500 miles south along the Ohio and Mississippi Rivers at the great port of New Orleans. The most efficient route to market remained along waterways and access to New Orleans remained crucial for the western economy and its settlement. This rapid population growth and geographic expansion caused a great deal of conflict. Native Americans in the west resisted American intrusion and fought renewed wars in the early 19th century. Furthermore, the expansion of plantation slavery beyond the coastal southeast meant that huge numbers of slaves were forcibly moved to new territories. In spite of these enormous human costs, the overwhelming majority of white Americans saw western expansion as a major opportunity. To them, access to western land offered the promise of independence and prosperity to anyone willing to meet the hardships of frontier life. 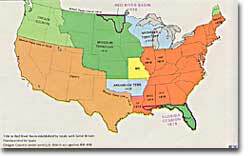 By 1820, the United States had more than doubled in area to become one of the largest nations in the world. Most politicians of the era believed that the health of the republic depended upon providing affordable land to ordinary white Americans. Among Jeffersonian Republicans most popular policies was an expansionist agenda that encouraged western development. This played an important part in cementing the Democratic-Republican party's strength in the south and west. Even among white settlers who benefited most from western migration, the expansion of the nation caused major alterations in American life. For instance, getting crops to market required improved transportation. States responded by giving charters to private companies to build roads (called turnpikes since they charged a fee), bridges, canals, or to operate ferry services. The state gave these companies special legal privileges because they provided a service that could benefit a wide segment of the population. 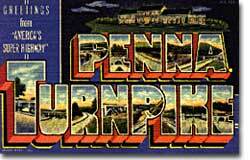 The Pennsylvania turnpike started out as a 62-mile long log-paved road in the 1790s. The establishment of roads and canals, and later, railroads, was a critical factor in the settlement of the West. Nevertheless, many people opposed these special benefits as contradicting republican notions of equal opportunity for all. These new transportation projects reshaped the American landscape, but the larger economic promise for most of the new western lands lay in the massive inland rivers of the Ohio, Tennessee, and Mississippi, all of which ultimately flowed south to New Orleans. Long before newspaper editors such as John Soule and Horace Greeley were urging readers to "Go West, young man," Americans were doing exactly that. Learn how public survey records from the early 19th century tell us what plants grew in the prairie. In a treaty with the French Republic, Thomas Jefferson agreed to buy the Louisiana territory. This move doubled the size of the country and helped the United States gain power in the eyes of other counties. 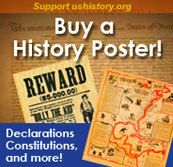 To see what was written in the treaty, check out this PBS site. PBS provides a multimedia tour of the settlement of the west based on their 8-part television documentary series. Get a firsthand look at the people, the gold and the battles for free soil, and find out how the "Wild West" got its name. One big problem facing westward expansion was the funding and path of the roads connecting the coast with the prairie. Albert Gallatin, a young surveyor, advised George Washington on possible routes and 17 years later developed a funding plan for Thomas Jefferson. This Earlham museum site provides all the details of the building of the westward turnpikes. Read the diary entries of William H. Ashley, a fur trader from Missouri back in the 1820s. Learn of the hardships faced by the travelers as they traversed mountains and faced snow storms and horse thieves! Watch 70 years of American territorial expansion in a flash — thanks to the Shockwave plugin.